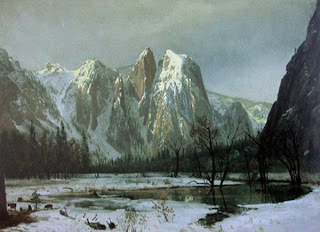 Albert Bierstadt was the greatest living American landscape painter for a brief period during the 1860’s and 1870’s. His paintings extracted prices ten times what other artists bargained for their work. Born in 1830 in Prussia, Bierstadt’s family immigrated to the United States in 1832. Albert’s interest in art was rivaled only by his fascination with money. While still in his teens, Bierstadt contracted with artist, George Harvey, to create a traveling show of Harvey’s landscape paintings. Projected on a 15’ x 17’ theater screen, Bierstadt charged the patrons an admission of 25 cents with nightly showings. 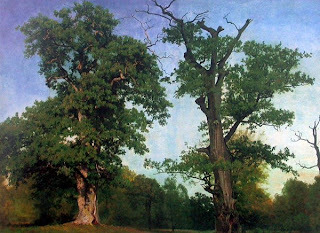 In 1853, Bierstadt traveled to Düsseldorf for three years of art study. The trip was financed by his various business endeavors in the United States. While not formally enrolled in the academy, Bierstadt trained with some of the school’s American students, including Eastman Johnson and Worthington Whittredge. Upon his return to the United States, Bierstadt organized his first trip to the Rockies in 1859. His skill at outdoor painting was unparalleled and he produced hundreds of studies in the field. Renting space in the now famous, “Tenth Street Studio”, Albert Bierstadt began work on his “Great Pictures”. The “Great Pictures” were impressive theater events. Hundreds of people stood in line for the opportunity to view Bierstadt’s paintings. Admission fees were charged and the paintings toured many cities. Albert Bierstadt excelled in this world. All through the 1860’s and 1870’s, his ability to cultivate important patrons and his flair for self-promotion gave Bierstadt meteoric rise to the top of the art world. His unprecedented rise begat the wrath of the art critics. This constant attack by the press and the rapidly changing tastes of the patrons and the American public contributed to the swift demise of Bierstadt’s art career. At his death in 1902, Albert Bierstadt was all but forgotten. Albert Bierstadt’s significant contributions to American landscape art are unquestionable. His idealized and romantic views of an untamed continent are at the root of the American promise of opportunity.